SALE- Vintage Glass Cloche/ Glass Dome With Antique / Wheel Gear Base- Vintage Taxidermy- Curiosity Display- Free Shipping! Announcement Welcome! 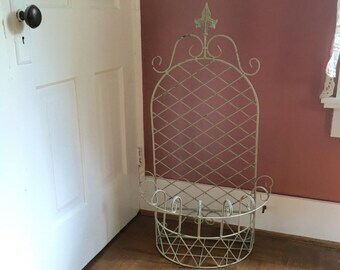 Here you'll find unique vintage items from the Appalachian countryside. 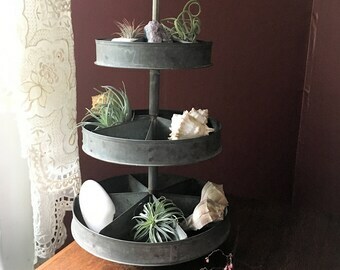 Specializing in rare, antique books, vintage book plates/ illustrations, rustic housewares, skeleton keys, sea shells and unique vintage. A Friday night poker game down by the river, a Saturday tent revival or catching fireflies on a steamy summer night. You'll find a little bit of everything here- from the rural barns and farmhouses of Appalachia straight to you. I do ship internationally, so if you don't see your country listed for a particular item, please convo me and we'll figure out the shipping costs. Welcome! 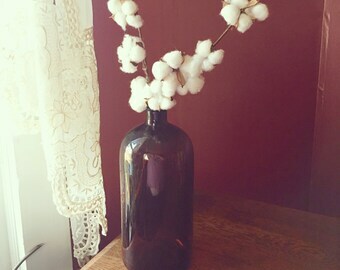 Here you'll find unique vintage items from the Appalachian countryside. 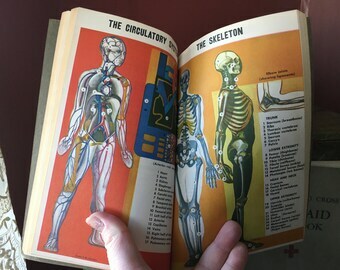 Specializing in rare, antique books, vintage book plates/ illustrations, rustic housewares, skeleton keys, sea shells and unique vintage. A Friday night poker game down by the river, a Saturday tent revival or catching fireflies on a steamy summer night. You'll find a little bit of everything here- from the rural barns and farmhouses of Appalachia straight to you. I do ship internationally, so if you don't see your country listed for a particular item, please convo me and we'll figure out the shipping costs. 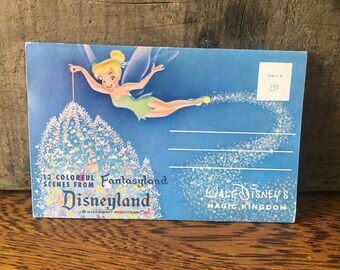 Vintage Disneyland/ Fantasyland/ Magic Kingdom Souvenir Folder/ Postcard Set- Free Shipping! Vintage 1952 Currier & Ives' America Book- Eighty Prints in Full Color- Free Shipping! 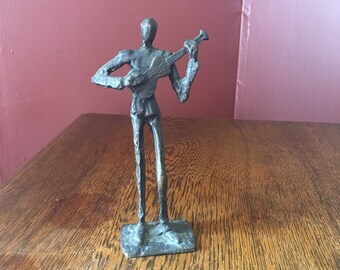 Vintage Brutalist Bronze Guitar Musician Sculpture- Mid- Century Decor- Free Shipping! 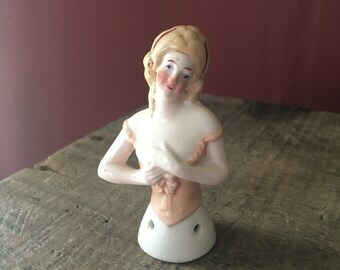 Vintage 3'' Bisque German Half- Doll For Hat Brush- Free Shipping! Vintage Cobalt Blue Hand/ Glove Display, Jewelry Display, Unique Home Decor- Free shipping! Vintage 1884 Book- "How to Read Character- Handbook of Physiology Phrenology and Physiognomy"- Free Shipping! 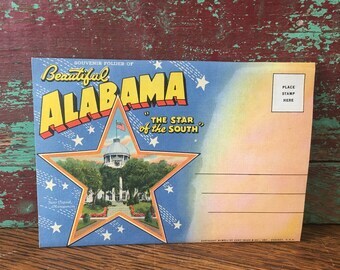 Vintage Alabama Postcard Set, "The Star of the South"- Free Shipping! 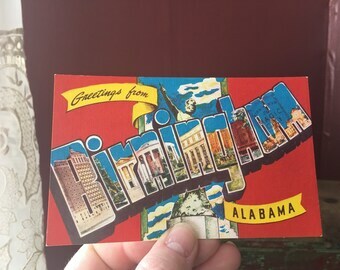 Vintage "Greetings From Birmingham, Alabama" Linen Postcard- Free Shipping! 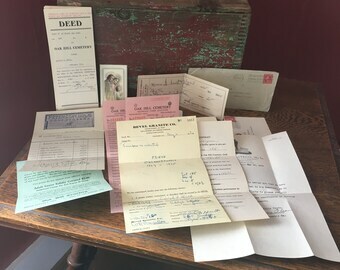 Original Vintage Paper Ephemera- 1917-1930's Undertaker Receipt, F unerary Services, Gravestone Papers, Cemetery Plot- Free Shipping! 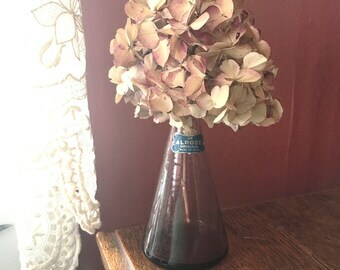 Vintage Alrose Italian Glass Vase- Alrose Decanter- Lavender Glass Vase- Pink Bud Vase- Free Shipping! 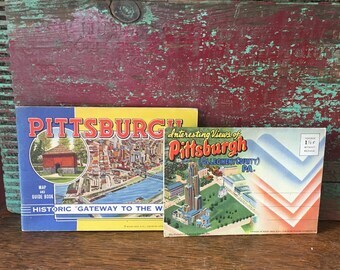 Pair of Vintage Pittsburgh Paper Ephemera- Postcard Set and Map & Guide Book- Free Shipping! 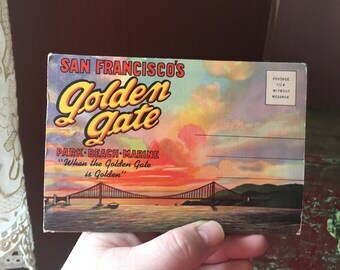 Vintage San Francisco, California- Golden Gate Bridge- Postcard Set- Free Shipping! Vintage Lot of 7 Florida Line Post Card Sets- Palm Beaches, The Florida Keys, Sarasota, Miami Beach- Free Shipping! 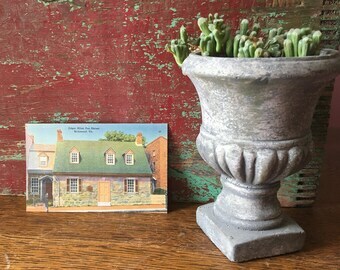 Vintage Linen Postcard- Edgar Allan Poe Shrine- Richmond, Virginia- Free Shipping! 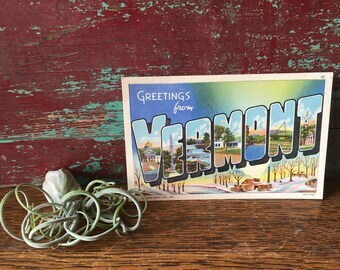 Vintage "Greetings From Vermont" Linen Postcard, Vintage Vermont- Free Shipping! Vintage Large Pink & Cream Pastel Southwest/ Native American Throw Rug- Free Shipping! This item is great! The back end of the arrow was a bit bent upon arrival, but being that this is vintage I am OK with it and was able to bend it back. As pictured and beautiful. I will shop here again. 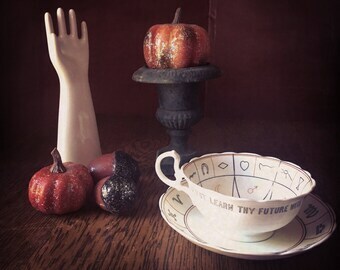 Antique Fortune Telling Teacup... featured on the Etsy blog. Perfect for your vintage Halloween! Need a place to display all your gourds and pumpkins? We got ya covered! SALE- Vintage Industrial 3- Tier Rotating Countertop Carousel/ Metal Nut & Bolt Caddy- Industrial Storage- Free Shipping! My favorite repeat find- these Mid- Century poison glasses! Rare vintage fortune- telling teacup from the 1920's. As a former Marine Biologist, I love all manor of seashells, specimens, fossils, and natural history items. 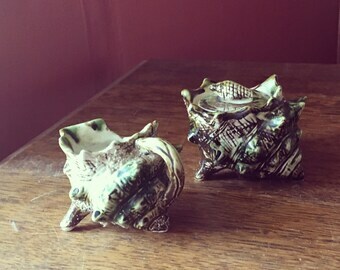 My most favorite vintage kitchen find- Owens Illinois Ruff -n- Ready Hoosier Jars! My tastes tend to run towards the macabre, like this vintage bank! NO RETURNS PLEASE. Remember, these items are vintage, they've had a whole other life before they were "revived". 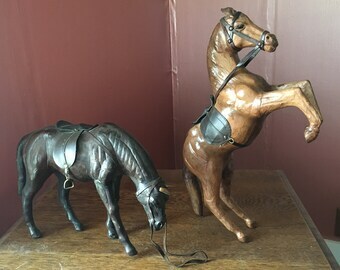 All items I list will be in good condition at minimum, but are aged- please check description for item. If there is an issue that occured during shipping, please contact me. Please let me know if there is a special circumstance. If a special circumstance occurs and item needs to be shipped back, return shipping is on the buyer. Thank-you. I accept Paypal, Credit/ Debit, and Money Order. **If you use a money order, your item(s) will not be shipped until payment is received. I usually ship two to three times a week. If you need an item shipped sooner, please convo me before you order. For international buyers: Please note that any additional VATs or import fees are the responsibility of the buyer. I have no control over who does or does not get charged these fees, and when you purchase from me you accept that it is your responsibility. There is no way that any seller can be accountable or knowledgeable about extra fees from other countries. -USPS for shipping, which already retains each individual's information. -Compliance with laws. I may collect, use, retain, and share your information if I have a good faith belief that it is reasonably necessary to (a) respond to legal process or to government requests; (b) enforce my agreements, terms and policies; (c) prevent, investigate, and address fraud and other illegal activity, security, or technical issues; or (d) protect the rights, property, and safety of my customers, or others. -Change, restrict, delete. You may also have rights to change, restrict my use of, or delete your personal information. 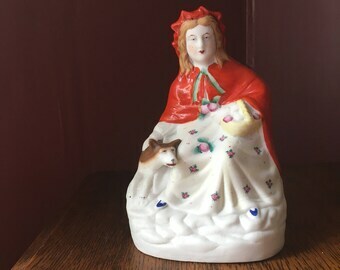 Absent exceptional circumstances (like where I am required to store data for legal reasons) I will generally delete your personal information upon request but it may still be available on the Etsy website. For purposes of EU data protection law, I, Kendra Moore, am the data controller of your personal information. If you have any questions or concerns, you may contact me at darby44621 [!at] yahoo.com.